For more than 30 years Ashore Realty has been Brigantine's undisputed summer rental leader! Although we are constantly marketing for new tenants, 60% of our summer rental business is repeat customers. Our customer service is second to none and our testimonials speak for themselves. In 2017 we were voted the 2nd best real estate office in all of South Jeresy and the BEST real estate office in Brigantine! The first step is to register your rental property with the City. You must fill out the registration form and pay a $150 fee to the City of Brigantine. You only have to register your property once but the $150 fee is to be paid every year you do rentals. The City must also inspect all rental properties. If your property is listed with Ashore Realty we wil coordinate inspections with the City. If you decide to rent your unit after the summer on a monthly basis (winter rental), another inspection must be performed at a cost to the City of $85. Barbra and Julie at Brigantine Fire Prevention can answer any questions you have regarding registration and inspections. (609) 266-3102. Fill out the Ashore Realty Rental Forms. There are no fees to pay Ashore Realty unless we rent your property. Ashore Realty does not do property management under terms of this agreement. It is the responsibility of the owner (s) to inspect the property, prior to the rental season and in between each weekly tenant to insure the unit is in good conditon and all appliances, air conditioners and utilities are in working order. Ashore Realty will not list a rental property if it is advertised at a lower price elsewhere. The price you are asking must be consistant whether you are renting your property on your own or listed with us. Any additional upfront fees you wish to charge your tenants such as cleaning, trash removal, taxes, etc must be included with the rental asking price. If your property is listed with Ashore Realty you are free to list your rental with other real estate offices as we do not require our owners to sign exclusive listing agreements but we do not allow other real estate office's rental signs to be displayed on the property. We require our owners to have their properties cleaned before each tenant checks in to insure your property is in tip top condition. We also require each homeowner to do a full spring cleaning prior to the start of the season. The City picks up trash once a week. We recommend having one trash can and one recycle can for every 3 people your unit sleeps. Example: If your rental sleeps 9 people, you should have three trash cans (with lids) and three recycle cans. Municipal residential trash collection is provided by the City of Brigantine to all single-family, two-family, three-family and four-family detached or attached dwellings. All items must be put out no earlier than 4:00 p.m. the day prior to collection or by 7:00 a.m. on collection day. Household trash must be in trash containers with lids. Failure to do so may result in a summons. Starting summer of 2018, recycles are picked up once a week (in the past they were picked up every other week). 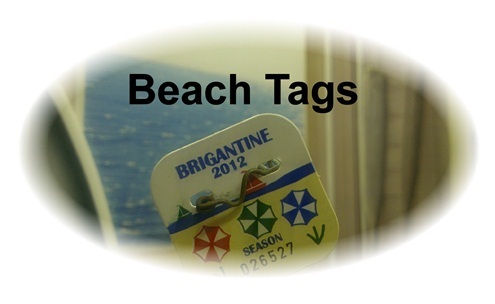 If you are providing beach tags to your tenants, keep them in the unit with instructions that there will be a fee for each lost tag. If your tenants lose or accidentally take home a tag, Ashore Realty has a limited amount of tags we can lend out to your next tenants until new ones are purchased. Most landlords keep the beach tags (and pool passes if provided) in a basket on the kitchen counter. 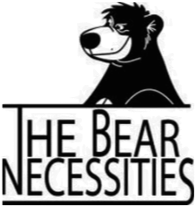 - Coffee pot, cooking utensils, pots (including a large pot), pans, etc. Owners are to supply Ashore Realty with 3 sets of working keys to their unit. 2 sets to be given to tenant upon check-in and 1 set to be kept in the office in case of emergency. It is a good idea to post a note on the refrigerator to your tenants explaining to them about lost tag fees, Internet password and trash removal/trash day. We will gladly design a custom flyer for you. 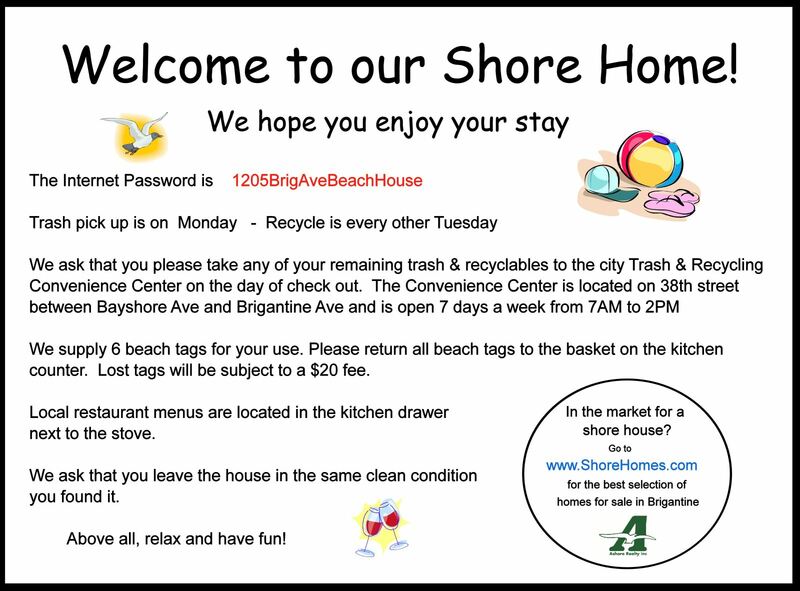 Simply e-mail the specific details you want on the flyer to rentals@shorehomes.com and we will e-mail you a pdf flyer for you to print..
Central air is king, window or wall units in every room at the very least. People simply will not live without access to their Facebook & e-mails. Not providing WIFI will cost you bookings. Be sure to display your Internet password where your tenant can see it. The National Sleep Foundation reported that 95% of Americans use an electronic device (TV, laptop) an hour before they fall asleep. You may be surprised at how many prospective tenants ask "do all the bedrooms have TV's" ? Charcoal or gas. If you're providing a gas grill please check to make sure it's working, has a full tank (and spare one if available) and in clean condition. Tenant's love hearing beach chairs are provided so they don't have to lug them down to the shore. Nice to have on a rainy day. Not many people have an outside shower at home so it's a really cool novelty to have one on vacation. Plus it keeps sand out of your house! People love their margaritas & wine when down the shore! It's always 5:00 on vacation! Be mindful of cluttter. Over the years of renting your vacation home, kitchen cabinets get full of useless items .... (excess tupperware containers, Wawa bags, plastic forks & spoons, etc). Each season empty the cabinets out to leave room for your tenant's food. Ashore Realty dominates the Internet when it comes to online marketing. We own a vast number of Brigantine related domain names including BrigantineSummerRentals.com, BrigantineRealEstate.com, BrigantineBeach.net and ShoreHomes.com to name a few. We also come up first on most Brigantine related Internet searches. Each year our web site has over 100,000 visits. Since we only deal with Brigantine rentals and Brigantine sales each person that visited our site clicked on because they were interested in Brigantine real estate or Brigantine rentals. This is one of the many reasons we are Brigantine's undisputed summer rental leader. In addition to rentals we've helped buyers and sellers come together for 30 years and our agents have an average of 18 years experience in the real estate industry. Ashore Realty Dominates in Online and Social Media Marketing! Ashore Realty was the first real estate office at the Jersey Shore that started giving their summer rental owners access to their web listing. All of our owners have a custom pin number that allows them access to their property information to book or unbook weeks, add or delete an unlimited number of photos and customize the description of their rental. This is ideal to keeping your rental listing fresh and prevent double bookings. E-mail us at rentals@shorehomes.com to get your personal pin number so you can get started today! E-mail us at rentals@shorehomes.com or call us if you have any questions regarding renting your shore home.